Alan Wake begins with a quote by Stephen King: "Nightmares exist outside of logic, and there’s little fun to be had in explanations; they’re antithetical to the poetry of fear." The line is spoken by the protagonist, novelist Alan Wake, and it’s hard to imagine a more appropriate opening. It’s a game spent in search of explanations, answers to the puzzling questions put forth by its narrative. It’s a very simple, effective hook — an author’s horror thriller is coming to life. The twist? He doesn’t remember writing it. It’s a great setup, but, as any writer well knows, it’s the follow-through that’s important. Without something to keep the reader engaged (or player, in this case), a story is doomed. As someone who has eagerly anticipated Alan Wake since its announcement nearly five years ago, I can say — with some relief, if I’m being honest — that Alan Wake will hook you to the end. It begins simply enough. Alan and his wife Alice are on a much-needed vacation. Bestselling author Wake has contracted a severe case of writer’s block, thus inspiring the vacation away from the hustle and bustle of New York with his wife. What better place, then, than Bright Falls, Washington, an idyllic little town on the northern Pacific coast? Of course, things aren’t quite what they seem and, before long, Alice goes missing and Alan blacks out, subsequently waking up in a wrecked car and missing an entire week of memories. What’s more, Alan discovers pages from a new manuscript, one he doesn’t recall writing. Even stranger, the words on the pages are coming true, effectively making Alan a character in his own story, a story of the emerging darkness in Bright Falls. 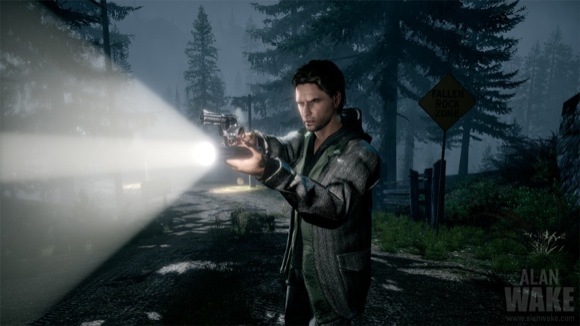 I don’t dare reveal any more here, but suffice it to say that the story — which would be strong enough to easily carry a movie or television series — is the strongest feature of Alan Wake. 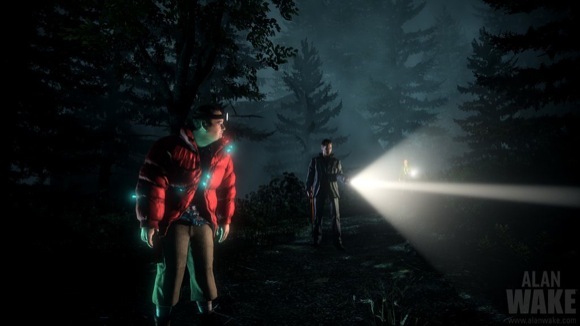 The developers at Remedy obviously knew this, as the game is structured into six self-contained episodes, complete with a quick "Previously on Alan Wake" montage at the beginning of each one. The episodic structure is integral to the experience, ending every episode (sometimes literally) with a bang and effectively punctuating each arc of the story. Thankfully, you don’t have to wait a week to see the next episode, you just have to hit the B button. The characters — even the minor ones — are well-written, memorable and, most importantly, backed by excellent voice actors. My favorite character is probably Alan’s agent, Barry, a New Yorker who shows up in Bright Falls wearing hiking boots, a Hawaiian shirt and a ridiculous, puffy orange jacket — an outfit I assume he deems appropriate for the Northwestern US. Each character feels very real, so it’s unfortunate that the models themselves look dated. They also suffer from occasionally horrendous lip syncing, at times making them look more like marionettes than people. Sticking with the writing motif, Alan actually narrates the game as it’s happening, offering insights to the story and clues as to what the player should do next. You’ll also collect manuscript pages scattered throughout each episode, each of which can be read on the spot. The page collecting mechanic is particularly addictive, as each page provides information on what the other characters are up to. They also subtly foreshadow events to come, providing even more reason to push forward. When, for example, a page described another character being attacked, I know I was always motivated to get a move on. 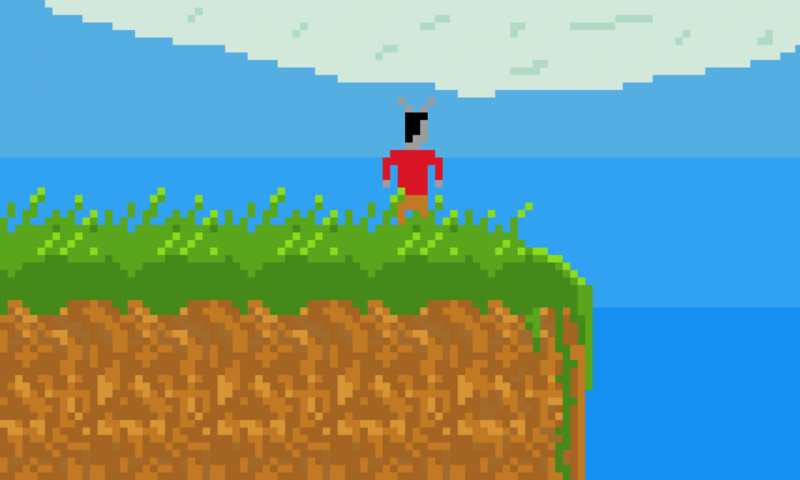 Of course, no story is complete without some obstacles, and Alan encounters plenty. First and foremost are the Taken, townspeople who have been possessed by the darkness pervading Bright Falls. In order to take them down, Alan must first bathe them in light, usually from a flashlight (though occasionally from other sources). Once the darkness is burned away, most of the Taken can be downed by a few bullets. It’s a tense, well-constructed system that has you focusing the flashlight with the left trigger and firing with the right, occasionally cramming batteries into the flashlight when it runs out of juice. The light mechanic also has the added benefit of turning fairly harmless implements like a flare gun or flashbang into weapons of mass destruction. The game relishes it, slipping into slow motion as a flare streams toward a horde of Taken, promising imminent and illuminating doom. Meanwhile, cars and trucks become light-powered battering rams. Apart from the Taken, Bright Falls is also littered with several less deadly distractions. Exploration is almost always rewarded with manuscript pages, a television or a radio. The radio programs offer extra background on the story, while the televisions sport episodes of a fictional, live-action TV show. It’s called Night Springs, an Outer Limits / Twilight Zone amalgam about — if you can believe it — a creepy town packed with paranormal activity. Even with the world falling down around Alan’s ears, I couldn’t help but stop to watch every episode I encountered. 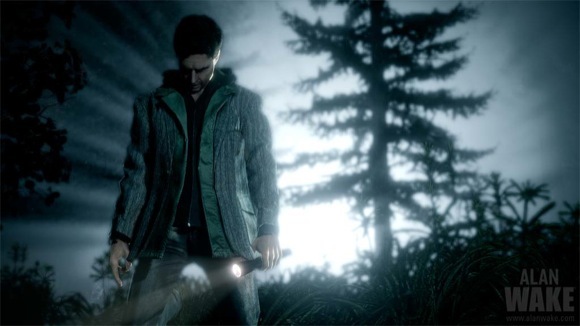 Ultimately, Alan Wake is driven — as is any good story — by the impulse to see what happens next. It offers up a believable world, characters worth caring about, enjoyable combat and a narrative I wanted to follow. Just remember what Stephen King said about explanations, because you won’t see all of your questions answered by the time Alan Wake comes to a close. That said, know you will be left wanting more.